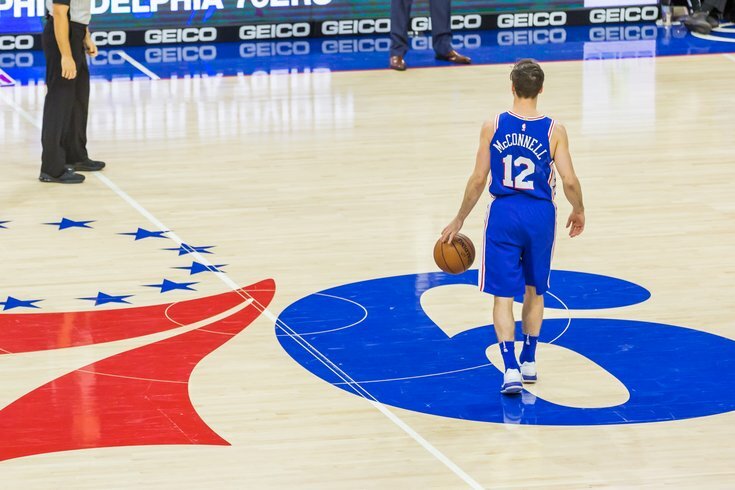 T.J. McConnell of the Philadelphia 76ers. The day has finally arrived. After a six-year hiatus, the Sixers are back in the playoffs and own homecourt advantage for at least the first round. It feels very strange to write that sentence, but all the losses, the failed draft picks, and the wheeling and dealing have produced the most promising Sixers team of the last 15 years. Standing on the other side are the Miami Heat, a tough but ultimately beatable team that the Sixers split their season series with. It may not have the juice of a matchup with a star-studded backcourt like the Washington Wizards, or a head-to-head battle with Giannis Antetonkounmpo and the Milwaukee Bucks, but it will test the resolve of the young Sixers and go a long way toward proving how ready they are for this moment. Before they suit up and play on Saturday night, however, it's speculation season for those of us waiting around for tip-off. The Sixers have coalesced over the last couple months into a team nobody wants to play, but there is still a decent-sized portion of uncertainty within the rotation and with Joel Embiid on the shelf. So let's fill in a few blanks in advance of the game in case the series preview didn't provide enough information to your liking. Do you think the Sixers’ end of season schedule has been too easy? Will their relatively easy last month affect their play in the first round? There is a real possibility the Sixers come out and are not truly prepared for the matchup. They're relying on a lot of young players who have never been in this environment before, going up against a team that is not going to beat themselves. But if I was going to point to a reason they'd lose or struggle against Miami, it wouldn't be because of the strength of schedule during their lead-in. In the middle of their 16-game streak to close the year, the Sixers played good teams from both conferences and stepped up to the challenge every time. They blew the Timberwolves and Nuggets off the floor in successive games, came up with a monster win over Cleveland, and with the No. 3 seed on the line on the season's final day, they wiped the floor with the Bucks and left no doubt about their positioning. It seems easy now because they're getting results, but the Sixers' play against bad teams has actually picked up quite a bit down the stretch. The Sixers didn't just lose to contenders like the Rockets and Warriors in the early part of the season, they coughed up games against the likes of the Suns and Kings. Their play was not consistent enough to guarantee a win against anybody, hence the blown leads that highlighted second halves up until about mid-January. They have earned a degree of trust for the work they've put in over the last three months. The pieces simply fit better now and that's a big reason why they've been one of the NBA's best teams since Christmas. Development for the young guys combined with improvements to the bench has turned close losses into wins and close wins into comfortable victories. Everyone should proceed with caution. Just don't allow yourself to be consumed by dread over their readiness, because this team plays hard and with a distinctive style every night. That's a recipe for playoff success, independent of their talent. What’s Justin Anderson’s role on this team in the playoffs/moving forward? At this point, your guess is as good as mine re: the long-term role for Anderson in Philadelphia. He got a lot of burn during the preseason and looked like he might grab a decent-sized spot in the rotation, but various injuries and ailments have relegated him to the bench for most of the year. He only appeared in 38 games for the Sixers this season, operating on the fringe in his first full season with Philadelphia. But I think he will find himself in position to contribute during the playoff run, if for no reason other than the fact that he brings something to the table other players on the bench don't. There's no like-for-like replacement for Robert Covington, who is a legitimate All-Defense candidate that combines his switchability with three-point shooting on the other end. The rest of the wing players who come in and surround Simmons are shooters and shooters only — Marco Belinelli has been a great addition, but he has strictly been an offensive upgrade, often being hunted on switches defensively. In a seven-game series, Miami (and potential future opponents) will seek out those switches as much as possible, and poor defenders hurt you more than they do in regular season games. If the Sixers reach a point where the matchup becomes untenable, Anderson is the obvious candidate to come off the bench and right that wrong. It's an imperfect solution because Anderson is nowhere near the shooter Belinelli is. But he provides athleticism and energy off the bench the Sixers don't have otherwise, and along with Richaun Holmes, he's going to be the guy who changes the pace and tenor of a game if things get tight. Emotional lifts via dunks are a very real thing. Do you think TJ is too good NBA player to have a small role in the team with Fultz back? That being said, does he has a future in Philly? Quietly, Fultz's return has allowed the Sixers to deal with an uncomfortable reality: McConnell has not been very good over the last couple months, and the Sixers' bench is much better off now that he is sliding into more of a bit role. Looking at the box score is not all that helpful in determining McConnell's contributions, because he has rarely been a stat-stuffer even when he's playing well. But the Sixers were straight up bad with him on the court in March, getting outscored by opponents by over six points per 100 possessions. This tracks with a storyline we have tracked all year: his willingness to shoot three-point shots dipped down to just over half an attempt per game during March. In fact, McConnell has taken only 22 3's since the start of February, an insanely low number for a guy who often finds himself in the corner with an open look from deep. He'd be able to get away with this if he was an elite slasher or finisher, but too often it ends with McConnell recycling the possession and the Sixers having to fight for another good shot. I think this season has been a good snapshot of what McConnell is: absolutely an NBA player, a pest of a defender, but ultimately limited in a larger role. He's a good guy to have around for the Sixers (or anyone else for that matter), as he represents a change-of-pace and more of a "sure thing" than Fultz at this stage. And by the way, do not be surprised if McConnell has to step up and play a big role in the series against Miami. He did an excellent job of defending Goran Dragic in the four meetings between the teams this season, taking on the responsibility basically whenever Covington had to sit. Fultz is nobody's idea of a defensive stopper, and Brown might call on his trusted backup if Fultz finds himself lost on the defensive end. Between Redick, Ilyasova, and Belinelli, who do you think the most likely to return next season? Least likely? Some of this depends on just how confident the team is in Fultz's shot getting back to the level it needs to be at. If he's more like the shooter he was in college than the non-shooter he has been this season, the Sixers don't need to invest premium resources at shooting guard. In a world where they don't manage to bring in a max free agent, the starting lineup writes itself: Simmons, Fultz, Covington, Saric, Embiid. That's your core, and the group of guys you're going to war with for the foreseeable future. But all that hinges on Fultz being Washington Fultz and not the kid who passes up open threes and dives into the teeth of the defense, sometimes to his own detriment. You simply can't have a backcourt of two players who won't attempt threes, even if Covington, Saric, and even Embiid can offer floor spacing. Fultz and Simmons are talented to make it work well enough for stretches, but frankly, you're going to run into a math problem when you're taking that shot off the table for 2/5 of your lineup. Ilyasova is probably the easiest guy to bring back because he was already in a position where he took a relatively cheap one-year offer to play in Atlanta last offseason. After that didn't work out, he was happy to come back to Philadelphia and serve as Saric's backup and a Swiss army knife on the backline, a role he is perfectly suited for. I don't think there's a great chance Redick would be down for a similar arrangement. He'll have lucrative offers on the table, including in places where he'll be a no-doubt starter. Redick seems to have a good relationship with Fultz and I think he understands that the teenage point guard is a bigger part of Philadelphia's future, but I'm not sure whether that means he'd be happy to fade more into the background as soon as next season. Besides, the Sixers do have a pair of young wings in Furkan Korkmaz and Timothe Luwawu-Cabarrot who they probably want to get out on the court for meaningful minutes at some point. Redick has expressed a willingness to return next year and the huge sum of money he got the last offseason might prompt him to take a sweetheart deal this summer. The smart money is on the bench guys, though, because the potential for a max free agent arriving will impact the money available at every other position. I'm always a little uncomfortable evaluating future draft classes this far out, if only because there's so much unknown when it comes to grading high school kids. This upcoming class was looked at as weak in comparison to the 2017 edition, only for Marvin Bagley to reclassify, Luka Doncic to continue beasting overseas, and the class to fill out a bit more as the season wore on. This class specifically would scare me if I were a Sixers fan looking at the pieces Boston could potentially add at the top of the draft. Were they using a pick in the 2-5 range themselves, they'd likely have the option to choose between some really interesting big men, chief among them DeAndre Ayton and Mo Bamba. Both have questions to answer at the pro level — Ayton's defensive concerns are well-documented, and Bamba is fairly raw at this stage — but would give the Celtics the big man of the future they have lacked for a while. This might say more about my respect for Brad Stevens than it does about Ayton or Bamba, but handing him a long, athletic prospect in the paint to pair with their young wings, Kyrie Irving, and Gordon Hayward is pretty terrifying as a concept. Avoiding that possibility is frankly almost as important as the Sixers getting something valuable with this theoretical pick — you don't want to see one of the rivals to your future ascent in the East load up on a piece that helps future proof the roster. Maybe the Sixers don't get another generational talent at No. 10, but I think Bridges is going to be an excellent pro and he fits almost exactly what they need (beyond Fultz) to go up another level over the next few seasons. If you tell me they can have Mikal Bridges alongside the current group in addition to not having to worry about Boston getting their big man of the future, I think I'd take that. Who's shot will improve more over the summer if you had to guess, Simmons or Fultz? The tricky part about this one is that right now there's a lack of attempts to go off of. Fultz has been more active as a shooter from mid-range, certainly, but neither guy is interested in shooting threes right now outside of end-of-clock situations. It's hard to know who will improve when we don't have a firm baseline to work from. But I think — and frankly, hope — the answer is Fultz, because his shot is so much more integral to the Sixers' future success than Simmons' is. If Simmons never comes around as a shooter, it will limit flexibility to an extent but is certainly capable of being worked around. He's big enough that you can put him on the low block and have him pass and score out of the post, or capable of being a roller diving toward the basket when he's not assuming ballhandling responsibilities. The same can not be said about Fultz, who needs that jumper in order to be a true impact player. He's getting on without it fine for now because he's in a minimized role as a backup, and the ramifications of his non-shooting have not quite emerged yet. He's only shooting about 55 percent on attempts from less than five feet, which is a product of teams sagging toward the paint and walling off the one area he's comfortable attacking right now. A jumper for Simmons is the difference between being an All-Star and potentially the best player in the league. A jumper for Fultz is the difference between being a talented but inconsistent backup and the consensus No. 1 player in a draft class filled with potential. History shows us we have more reason to believe Fultz can be a shooter than Simmons, as he's the only one in the pair who has ever been a prolific shooter at any level. So give me Fultz, even with all the weirdness surrounding his shot this year.